In his freshman budget, Gov. Gavin Newsom heartened beleaguered school districts and community colleges by offering pension-cost relief. Districts had been bracing for a big increase in payments to CalSTRS, the pension fund for California teachers and administrators. Instead, under the proposed budget, they’ll pay about half the raise in rates they had anticipated next year and in 2020-21. Newsom is proposing to use some of an expected state budget surplus to pay roughly the other half — $700 million divided over two years. School leaders are expressing gratitude for the help — not as much for the amount, which is modest compared with the overall pension burden, as for Newsom’s recognition that districts are struggling. Pension payments are a big factor in districts’ rising costs. They didn’t write the lesson plan or instruct Cristopher Bautista’s ninth-grade English class. But members of United Teachers Los Angeles were a powerful presence in the classroom where he works at Oakland Technical High School. UTLA had taken to the streets 370 miles south, striking for smaller classes, a living wage and more help for their mostly low-income students. Bautista was teaching “Cannery Row,” John Steinbeck’s classic tale of Central Coast haves and have-nots. “I’ve been teaching about the [Los Angeles] strike to my kids,” Bautista said on Day 5 of the UTLA walkout, which ended last week with the union making incremental gains in wages, classroom sizes and support staff. Bautista sees thematic overlap between Steinbeck’s book and the L.A. work stoppage, which drew international attention. “It’s about class struggles, what people need to get by, low pay. There are parallels.” The six-day UTLA labor action already has had an impact beyond Southern California, one that is only expected to grow. 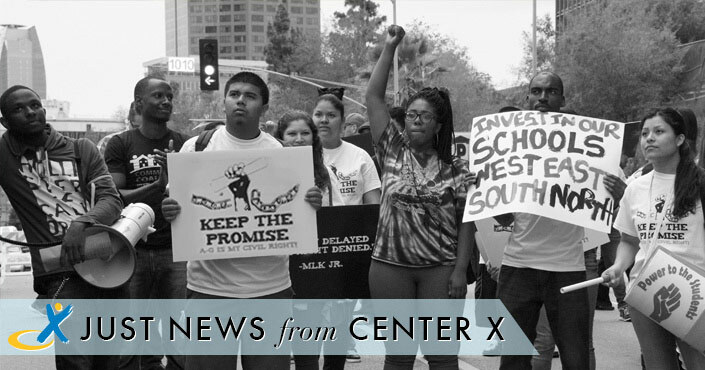 It has intensified a critical public conversation about how education is paid for, highlighted the effect that charter schools have had on struggling districts and likely will put pressure on Sacramento to funnel more funds to the state’s schools. The Los Angeles strike also has heightened the possibility that voters could roll back parts of Proposition 13, the landmark 1978 state law curbing property tax increases. A measure to end Proposition 13’s protections for commercial and industrial properties has qualified for the November 2020 ballot. Can mental health training for teachers reduce preschool suspensions? California is trying to support young children by providing more mental health assistance to their teachers. Making struggling students repeat third grade is an increasingly popular idea. Back in 1998, California was the first state in the nation to require students to repeat third grade if they couldn’t read at a basic level, as measured by the state’s annual tests. Another 15 states, plus the District of Columbia, followed suit and passed similar “retention” laws. Nevada and Michigan will join them in the upcoming 2019-20 school year. The hope is that if kids can become proficient in reading early on, they’ll be much more likely to succeed in all of their subjects, from science to social studies, because students need to know how to read to learn the material. That might seem like a reasonable approach but there’s controversy among researchers about whether repeating third grade is ultimately helpful. Although some studies have found that students who are held back at a young age tend to post higher test scores than similar kids who were promoted to the next grade, this initial bump in scores fades out over time. Six years later, according to one 2017 study, the retained kids weren’t testing any higher than their promoted peers at the same age. (However, when the authors compared test scores at each grade level instead of each age, the achievement gains persisted.) Skeptics have also pointed out that being held back is both expensive for school districts — taxpayers end up paying an additional year of education — and demoralizing for students. One 2014 study found that kids who were held back when they were young were less likely to graduate from high school. The recent videotaped encounter at the Lincoln Memorial left many wondering about the state of reasoned political discourse in the country, or if it exists at all in a hyperpartisan era of red “Make America Great Again” hats versus pink women’s march caps. In a video from Jan. 18, a group of boys from Kentucky’s Covington Catholic High School, a Native American activist and a cluster of Black Hebrew Israelites faced off in an uncomfortable confrontation that spread online and in the media. It has prompted national debate about both civility in politics, the seeming lack of tolerance for those of differing political beliefs and how both are influencing the nation’s youth. That debate sounded all-too-familiar to Ohio social studies teacher Judi Galasso, who has taught a class on political radicalism for three decades now. “If someone’s yelling things at you, if you’re presented with groups that you disagree with, my hope is that we train our kids well enough that they’re not going to react,” Galasso said. Galasso and co-teacher Jonathan Duffy invite members of America’s most extreme political groups —including the National Socialist Movement, the Weather Underground and the Revolutionary Communists — into their classroom each semester. They teach students to engage respectfully with those of differing beliefs and to ask questions. In response to media reports of increased teasing and bullying in schools following the 2016 U.S. presidential election, we investigated its prevalence with a Virginia school climate survey completed by approximately 155,000 seventh- and eighth grade students in 2013, 2015, and 2017. Survey results were mapped onto presidential election results for each school division’s locality. In localities favoring the Republican candidate, there were higher adjusted rates of students reporting that (a) they had experienced some form of bullying in the past year (18% higher) and (b) “students in this school are teased or put down because of their race or ethnicity” (9% higher). For these two outcomes, there were no meaningful differences prior to the election. These results provide modest support for educator concerns about increased teasing and bullying since the 2016 presidential election in some schools and warrant further investigation. Global collaboration projects, which allow students to work with peers across geographical boundaries, aren’t just interesting, engaging, and fun. They also address several of the ISTE Standards for Students, including “Digital Citizen,” “Global Collaborator,” and “Empowered Learner.” Each year, a wide range of global education projects are demonstrated during the MassCUE Global Ed and CUE Kids student showcases, allowing Massachusetts students to take the lead in sharing about their work, thereby highlighting their ownership of the learning process and the role of student voice in successful learning outcomes. Providing opportunities for global collaboration not only engages students, it also builds cultural understanding and empathy and helps with development of important communication and problem-solving skills. This year, student projects focus on civic engagement and social justice; leadership development through global service and STEM/STEAM learning; and international travel and exchange programs. It’s almost too easy to satirize physical education, better known by its eye-roll-inducing abbreviation P.E. From Clueless to Superbad to Spiderman: Homecoming, parodies of gym class are a pop-culture darling. Perhaps that’s because they speak to one of America’s fundamental truths: For many kids, P.E. is terrible. A recent working paper focused on a massive P.E. initiative in Texas captures this reality. Analyzing data out of the state’s Texas Fitness Now program—a $37 million endeavor to improve middle schoolers’ fitness, academic achievement, and behavior by requiring them to participate in P.E. every day—the researchers concluded that the daily mandate didn’t have any positive impact on kids’ health or educational outcome. On the contrary: They found that the program, which ran from 2007 to 2011, actually had detrimental effects, correlating with an uptick in discipline and absence rates. How are states measuring student growth under ESSA? Almost every state is rating schools in part on student growth in test-scores under the Every Student Succeeds Act. (The exceptions: California and Kansas). But that doesn’t look the same everywhere and the differences matter to parents and policymakers, says the Data Quality Campaign, a research and advocacy organization. So what are the different types of “growth models” and who is using what? The DQC breaks it down in a report entitled “Growth Data: It Matters, and It’s Complicated” for those of us who aren’t psychometricians. The most popular measure is a “student growth percentile.” It essentially tells parents and policymakers how schools served different kids who started at about the same academic level. Twelve states use a “value table” which gives a measure of student progress. It shows whether kids moved from the “basic” to “proficient” level on state tests. Ten states are using a “growth to standard measure” which gives a picture of how far on, off-track, students are from where they are supposed to be at this point in their education. It can also give a sense of how long it will take the student to catch up (meaning reach the “proficient” level). Eight states have chosen “value-added” measures which shows the impact of teachers and other adults in the school on student achievement. Three states have a “gain score measure” which looks at how much students have improved from one year to the next. Alabama’s high school graduation rate was one of the lowest in the country in 2011. Today, it’s one of the highest. Over that same period, though, Alabama students have continued to perform among the worst in the nation on federal math and reading tests. That leaves the state with a jarring disconnect between its students’ academic skills and the share of diplomas it hands out. And while Alabama’s numbers are outliers, that disconnect exists in many other states. States with low test scores don’t necessarily have low graduation rates, and vice versa, data released last week for the class of 2017 shows. And state test scores are less pegged to graduation rates than they were several years ago, according to a Chalkbeat analysis. It’s the latest indication that the nation’s graduation rate gains may have more to do with changes in graduation standards than with how much students are learning. The U.S. graduation rate rose from 79 percent to 84.6 percent from 2011 to 2017, even as test scores stayed largely flat. Educators all over the world are thinking creatively about ways to transform the traditional education system into an experience that will propel students forward into the world ready to take on its complex challenges. Competency-based education has piqued the interest of many communities because of its promise to make learning a more personal experience for students. In a competency-based model, children move through school based on their ability to demonstrate proficiency in skills and content, not by how many hours they spent sitting in class. Teachers have long faced the difficult task of designing lessons for a group of students who are not all alike. Students come to school with different exposure to academic opportunities, disparate lived experiences, and unique interests and passions. For decades teachers have tried to impart a set curriculum in a limited amount of time to this heterogeneous group of students. And regardless of whether all students grasped the concepts and skills, for the most part students moved forward with their age cohort to the next grade. Most Americans agree that education is a national priority. Yet, despite efforts over the last 20 years to improve the performance of our schools, the U.S. public education system falls in the middle of international quality rankings. But let’s be clear: the problem with education in America is not lack of excellence. It’s lack of equity. The group was small but hard to miss with their large posters and matching yellow beanies. “Hey hey! Ho ho! Period poverty has got to go!” they chanted. On Monday, 40 students and some adults marched near Education Department headquarters in Washington, calling on Secretary Betsy DeVos to take action to combat what they call “period poverty.” Their list of demands included comprehensive period education for students of all genders before age 12 and programs that would equip K-12 school bathrooms with free menstrual products. Students and activists have pressed for years for school bathrooms to be supplied with menstrual products as part of a national movement for “menstrual equity.” It aims to provide access to menstrual products to anyone who needs them, especially those from low-income families. New Jersey’s K-12 public school system has already been deemed one of the most segregated in the country. But is the state’s higher education system also set up to leave minority students locked out? A new report paints a bleak picture. Correspondent Briana Vannozzi recently spoke with Michael Dannenberg, the report’s co-author and director of strategic initiatives for policy at Education Reform Now. Carrying protest signs, thousands of teachers and their allies converged last month on the shimmering contemporary art museum in the heart of downtown Los Angeles. Clad in red, they denounced “billionaire privatizers” and the museum’s patron, Eli Broad. The march was a preview of the attacks the union would unleash during the teachers’ strike, which ended last week. As one of the biggest backers of charter schools, Mr. Broad helped make them a fashionable and potent cause in Los Angeles, drawing support from business leaders like Reed Hastings, the co-founder of Netflix; Hollywood executives; and lawmakers to create a wide network of more than 220 schools. Mr. Broad was so bullish about the future of charter schools just a few years ago that he even floated a plan to move roughly half of Los Angeles schoolchildren — more than 250,000 students — into such schools. In 2017, he funneled millions of dollars to successfully elect candidates for the Board of Education who would back charters, an alternative to traditional public schools that are publicly funded but privately run. His prominence has also turned him into a villain in the eyes of the teachers’ union. Now Mr. Broad and supporters like him are back on their heels in Los Angeles and across the country. A South Los Angeles charter school network reached a tentative deal Sunday to end an eight-day strike, the first job action of its kind in California, union officials said. Accelerated Schools’ teachers are expected to return to their classrooms Monday morning and vote on the agreement in the afternoon, United Teachers Los Angeles said in a news release. Teachers at Accelerated’s three schools walked out Jan. 15, a day after thousands of other L.A. educators at regular public schools began a strike against the L.A. Unified School District, the nation’s second-largest school system. Charter schools are publicly funded but run separately from regular public schools. UTLA represents teachers in district schools and at Accelerated under different contracts. The Accelerated walkout marked the first time that a charter school organization in California went on strike, and only the second nationally. The Accelerated Schools’ strike followed a recent four-day walkout at the Acero charter school network in Chicago, the first charter school job action in the U.S. While LAUSD teachers demanded better pay, smaller class sizes and more support staff, more than 75 Accelerated instructors sought increased job security and improved health benefits to reduce the high teacher turnover rate at the schools. A wide variety of anxieties about the state of public education in Los Angeles — ranging from high class sizes to low salaries — drove thousands of teachers to strike for six days this month. But many striking members of the teachers union had another demand: do something about charter schools. Charter schools are publicly funded and part of the L.A. Unified School District — but they’re privately run. This means they have increasingly competed with LAUSD to enroll the city’s students, and to capture the per-pupil funding that comes with those students. Leaders of the teachers union, United Teachers Los Angeles, proposed a solution to what they see as a growing threat: a cap on new charter schools within LAUSD. They even emerged from strike-ending negotiations last week with suggested legislation for a charter cap that the school board could vote on. While walking the picket line of the Los Angeles teachers’ strike last Wednesday, Linda Bieber and her friend Jessica Rhee carried signs that outlined a primary grievance of their labor union, United Teachers Los Angeles: overcrowded classrooms. “I can TEACH 43, but I can’t REACH 43,” said the sign that Mrs. Rhee held. Ms. Bieber and Mrs. Rhee, along with more than 30,000 other Los Angeles Unified School District teachers, went on strike last week, demanding, among other things, decreased class sizes. The strike ended Tuesday with the district agreeing to cap class sizes, as well as to other resolutions. Middle and high school math and English classes will be capped at 39 students — as elementary school classes already are — effective immediately. By 2022, academic classes at all grade levels will be reduced by four students. When we asked teachers to tell us what it’s like to teach their largest classes, we heard from a wide range of them, some of whom teach classes of 60 or more students. Here is a selection of their stories, which have been condensed and edited for clarity.